In Central, SC, Saturday was a Great Spring Day. We celebrated the heritage of the Railroad in the town of Central. There were many great activities available for children and adults at the Festival. Quite a large number of people came into Central on Saturday to enjoy the festivities and the live performances of the musicians. One of the early activities on Saturday was the unveiling of the Quilt Trail quilts in the garden of the History Museum of Central. The Quilt Trail movement originated in Ohio and has spread across the country and in two provinces of Canada. Family or favorite quilt designs are replicated on weatherproof materials and mounted, originally on barns, on various outdoor surfaces to be seen by passersby. At this time 34 of these quilts have been installed in upstate South Carolina. At the History Museum there are three such mountings - one on a garden post and two on a Garden Arbor built by a local woodworking artisan. When you are in Central next, go by the History Museum and walk into the garden to see these beautiful displays of quilt art. They are truly inspiring. 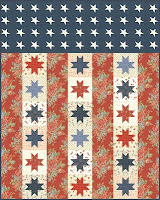 At Heirlooms & Comforts this week we will feature patriotic red, white and blue fabrics. We have recently received several bolts of wonderful Quilts of Valor fabrics. For this week we will double-punch your fabric card when you purchase the qualifying dollar value for punching. You will love these fabrics for making your Quilts of Valor or Wounded Warrior Quilts. They are especially good looking fabrics! So, when you buy $5 worth of these fabrics we will punch your card for $10. If you don't have a card already, we will see to it that you have one and explain the way the program works. Mother's Day is coming fast! Get ready. You know Mother is deserving of the best and Husqvarna Viking has that for her. At Heirlooms & Comforts we have two special models that have been classroom models and carry full warranty. Either the Sapphire 875Q or the Designer Diamond will give the wonderful, efficient use that Mother is hoping for in her next machine. These are specially priced, but you must come into the shop to get the price quotes since they are lower than we are able to quote in the media. Quantity is limited on these models! Come in to test sew on one. This is Naaman here. I am the big brother to Miles and Finn who just got born about 10 days ago. Life is really different around here. Grandma and Grandpa came to visit and it has only been three months since they were here last. But the babies are here now and they show up to ooooh and aaaah over them. They gave me some attention too while they were here. Grandpa is pretty cool, you know. He helped Dad and me build a gate for the new fence between us and the neighbor. She was nice enough about the construction on the fence so Dad and I offered to put her a new gate between her front and back yards. The tools are what I like. Grandpa was telling me how he likes tools too. He uses ones that are not as noisy as the big ones Dad and I use. My favorites are the electric drill and the leaf blower. The shop vac is nice; it is pretty noisy. Dad has taught me to wear my goggles when using tools to protect my eyes. They get kinda hot and make me sweat, but sweating is a macho thing to do when you are working - looks like you are really doing something. Anyway, Grandpa, Dad and I work pretty well together. Only thing is, when I start to be insistent about something they start saying stuff about me getting on toward two years old. They better watch it cause I have seen some of those two-year-olds and how they operate. I could do what they do if they don't let me do what I want. Maybe I'll hold off on that and spring it on them when they least expect it. Maybe a good time would be when Miles and Finn get too much of the attention around here. So far it has gone pretty well for me. Dad is going back to work full time tomorrow so it could get to be difficult for me when I want something. We'll see what has to happen. Too bad Grandpa and Grandma can't stay a really long time. Really my Nana and Poppie come more often and they will take my side any time I get slighted - so does my Aunt Sissy. Oh, well I just thought I would write again for Grandma since she does this every week and I could give her a break. Go into Heirlooms and Comforts often to see Grandma. She loves when you come. She told me so! At Heirlooms & Comforts this week we will feature the Katagami collection of prints from Red Rooster Fabrics. Just arrived is this beautiful two-color print group in cream and navy. There is a koi print that is outstanding and a stripe with a crane figure as well as some prints with pine boughs and mums. There is a strikingly pretty pattern available on the Red Rooster web site as well. You have to see this; it is really nice. At Heirlooms & Comforts we have several units of classroom model Sapphire 875Q machines. These are super for quilters who want the extra space to manage a large quilt in the quilting process. The extended sewing surface gives room for manipulating the bulk of the quilt as you machine quilt. The Exclusive Sensor System on this machine is also an asset for the machine quilter, not to mention the Selective Thread Cutter and the automatic tension control. You just need to see these machines and sew on one to see how wonderful the 875Q is for you. The price is GREAT and the supply is limited. Community is a great word with wonderful meaning: a group of people, a neighborhood, kinship, the public, the people. Have you lately experienced community? It is a great happening or condition! We have community of fellow citizens; we have community of educators; we have community of quilters; we have community of leaders politically. There are many ways we can find community. Bobby and I just experienced community of our daughters and their friends. There was a gathering of that community around the spring sporting event on Saturday for convivial conversation and food. It is especially nice when the young people include the "seniors" in their gathering. It is especially nice to observe the developing community and the evolution of the very young into social beings. I watched Reid as he (age 15 months) approached another baby with an expression of wonder and inquiry. Reid has a facial expression that is worth a thousand words. He looked this one-year-old directly in the face and got not much response so he just flashed his winning smile of acceptance. It is one that no one can resist - the smile comes and you are instantly "taken". It is priceless to see the sharing offers and attempts to become friends. Of course Reid has two handy examples of how to get along in his brother Jackson and close-as-a-brother-cousin Wyatt. Life is wonderful at this stage! By the way, the younger baby finally came around to being friendly with Reid. Community is great! At Heirlooms & Comforts this week we will feature Thimbleberries books at 50% off. This is in no way a misprint. Thimbleberries books are 50% off original price until the end of the day on Saturday, April 16, 2011. You choose from the basket of books the ones you want. You will find the choices are varied from table runners to king-sized quilts and all between these in sizes. Most of these are very easy to make and are graphic and beautiful designs. We do have quite a variety of projects and designs. This is a bargain, ladies. At Heirlooms & Comforts we still have several classroom machines available at great prices (too low to be able to advertise. Several are Designers and there are some Sapphire 875Q models. You should test sew on these to see how well they sew. There are not many of these to sell, so come by soon. Life is full of joy! Really, it is great when you don't have to suffer the pain, but you can share in the joy. Such is the situation with being a grandparent - WOW! Miles Bennett and Finn Elijah were born on March 31 in mid-afternoon - 6lbs, 2oz and 4lbs, 13oz. What a wonderful mother to endure the waiting abed for so long and the birth of these boys. Big brother Naaman is pleased (so far) with having two brothers. Wonder what the response will be in two years? Mother and boys are doing well and Dad is "busting his buttons". Joy unspeakable! Great-grandmother, Mema, was a twin and always hoped to see grandchildren or great-grandchildren twins. She missed these, but would have been surprised and happy at who is the parent of these twins. There is something rather magical about this kind of miracle. Grandpa and I are grateful and thankful for the safe arrival of Finn and Miles. Granddaddy Newton always told me the only way to pay for your raising is to raise one of your own. Now our son gets to deal with a family ¾ the size of the one we raised. We will always be praying for guidance for him and his wife. Here goes a great adventure! At Heirlooms & Comforts this week we will feature 20% off any one item of your choice excluding Department 975 (machines, sergers, software suites, and cabinets). Choose something that you normally would not purchase on impulse or something that you buy almost anytime you are in the shop. One item of your choosing can be 20% off regular retail price this week. Remember that book that you wanted? Now is the time. How about a new cutting mat or even a second one of a different size? Maybe a new easy-blade-change rotary cutter or those Gingher scissors that you have wished for would make you happy. You choose! At Heirlooms & Comforts we are continually surprised by the opportunities that are provided by Husqvarna Viking to make it easier for our customers to become Viking owners/users. At the moment H-V has an offer for you to purchase a top-of-the-line Designer Diamond sewing-embroidery machine that has been opened and used for about three hours under the supervision of Viking specialists in a classroom such as an Heirloom Sewing School. These machines carry full warranty and are in no way at risk and have an unbelievably low price tag. We have access to several of these machines in limited quantity. Come by for a full demonstration of how these machines work - you'll love it. You must come into the shop to get the price quote - too low to advertise or quote by phone. At Heirlooms & Comforts this week there will be new "residents" on the sale table in the fabric "neighborhood." You can never tell when one of those that you have hesitated to choose will end up on the sale table at a great discount. It could become the backing of that quilt that needs to be finished. This week there will shifting in the racks. Be the first to review the new reductions.